Keya fusion technology Pvt. Ltd. manufacturing limited is an Indian based company that manufactures magnet and magnetic jewellery. Our product designs include all kinds of magnetic jewellery like titanium bracelets, titanium rings, titanium necklaces, titanium earrings, titanium bangles and scalar energy pendants. We use healthy elements such as magnet, germanium, negative ion, far infrared and tourmaline in making these titanium jewellery. They are becoming one of the most fashionate jewelry pieces in the market and they are the most dazzling bracelets in the world. Also, its stronger than steel and less than a quarter of gold in its weight. 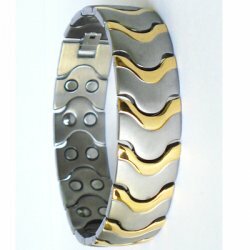 Titanium bracelets are one of its kind and are known for its durability.They are available in unique styles and designs and are regarded as a fashion statement. Although titanium bracelets are for women, it is also known for lending itself best to masculine styles and it also offers that extra durability men require in their jewelry. And most importantly we offer superior quality titanium bracelets at much affordable prices. So, why sacrifice beauty for durability when you have both in titanium bracelet. The titanium bracelets are in demand as they are known to have positive effect on ones health because of the healthy elements used in manufacturing them. They help in improving blood circulation and immunity, puryfing blood, reducing endocrine, delaying aging process, strengthening metabolism, activating cells and reducing fatigue. Titanium is naturally platinum gray and is allergic free. Our titanium jewels are available in multiple style and designs and you would be amazed to find such a vast collection at a much lower rate in comparison to the market rates. Therefore, if you want a stylish bracelet which would last lifelong and can be passed on to your younger generations without losing its charm then you have to go for our titanium bracelets. You can't go wrong with our collection of titanium jewellery.